Jack and Benny Lipson are twin brothers who perform together as jackbenny. 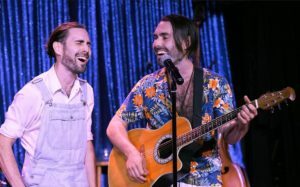 They have been in monthly Residency at the Lyric Hyperion and their July 8 show was their fifth in a continuing series. The brothers are extremely talented musicians each playing multiple instruments—piano, bass, drums, kazoo, guitar, tambourine but no cello. Their show featured 16 songs, 15 written by the pair covering such topics as Happiness, the #MeToo Movement (“When Starting with Consent”), Optometry (“The Eye Doctor Song”) and love and relationships in all their various permutations. The brothers have an easy, relaxed vibe with each other and with their audience. Their lyrics are clever and astute and the melodies have a heavy jazz influence with a shade of classical thrown in. The duo was greatly aided by Theo Seidmon on percussion. At one point during “It’s Not Cool to be Cool Anymore”, all three were tapping away on a marimba. 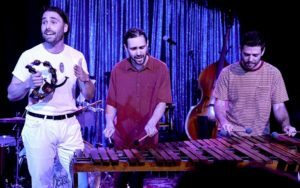 When was the last time you saw a marimba in a cabaret act? 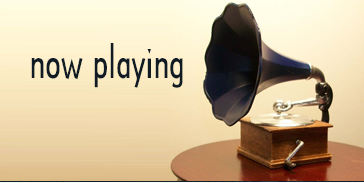 jackbenny uses one. Or when was the last time you saw twins performing a cabaret act? The brothers also had some musical guests join them on vocals–their theatre star mother Valerie Perri for The Beatles “Help” and Jonathan Reinhart AKA Anita Procedure for “Asking-Queer.” Jesse McGinty joined them on trumpet and tenor sax for “The Warmth of a Stranger.” A fun time was had by all.